Established in 1978, Giochi Preziosi is the market leader in in the toy industry in Italy. For more than 35 years, Giochi Preziosi has been able to establish itself in both the local Italian and international markets thanks to a dynamic company culture and responsiveness to market changes. The Jade app was a great find! We configured the app and created a sign-up form in seconds. We were able to collect email address from many attendees, even while offline. Because of this, we’ve decided to use the Jade app in our next promotional events and tours. As kids grow up, so do the toys they play with change, sometimes in just a matter of a few months. Because of this, the mailing lists of Giochi Preziosi are frequently updated to keep up with the interests of its customers – both kids and their parents. As a list building objective, Giochi Preziosi was looking to renew their email database and sign-up new subscribers with a marketing tool that could collect new subscribers from events and trade shows in an easy, fast, and digital way, which would replace paper forms. Giochi Preziosi needed to accomplish within their marketing department without additional budget and involvement from other departments. Giochi Preziosi chose the MailUp Jade app for iPad to collect event attendees’ email addresses at the international toy exhibition G! come Giocare 2015 in Milan, Italy. 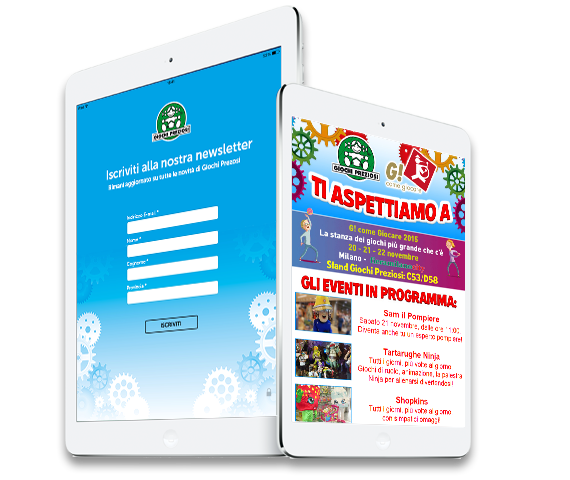 The first step for Giochi Preziosi was to build a mobile sign-up form on the Jade app. They added their logo, a few images and the following fields: Name, Last Name, State/Province, Email Address. These four fields were just enough for the marketing team at Giochi Preziosi to segment new subscribers geographically, allowing them to send more personalized emails. At the exhibition, Giochi Preziosi used the Jade app on their iPads to collect new subscribers. The whole sign-up process was efficient. The new email addresses collected with the Jade app were being automatically added to the mailing list and group in their MailUp platform. To all of its new subscribers, Giochi Preziosi sent a welcome email which asked them to confirm their email subscription in order to establish a double opt-in status, which is an email marketing best practice. Once the exhibition was over, Giochi Preziosi also sent a follow-up email with a special holiday gift inside. Giochi Preziosi collected a total of 1978 email addresses through the MailUp Jape app at the G! come Giocare exhibition. From the total collected, 66% attendees confirmed their interest in subscribing to the Giochi Preziosi mailing list. Through this list building initiative, Giochi Preziosi increased its mailing list size by 5.8%, which was a very positive result for the marketing team. Another positive result is the click-through rate – 36.38% – for the follow-up email, which was twice as much as other campaigns on average. Get everything setup in the Jade app: create your mobile sign-up form, connect your mailing list in MailUp, and setup the confirmation email for double opt-in subscription. Provide an incentive, such as a discount, at events to sign-up to your mailing list. Don’t ask too much information in your sign-up form. You can always your subscribers to update their interests and preferences in a later email. Include something special, such as a Giochi Preziosi‘s holiday gift, in your follow-up email. Your subscribers will thank you and remain much more engaged with your brand.